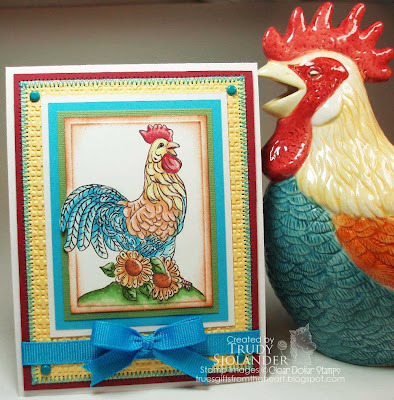 Today I have prepared a tutorial to show you one of many ways to color the rooster from Clear Dollar Stamp's "Rooster Sunrise" stamp set. 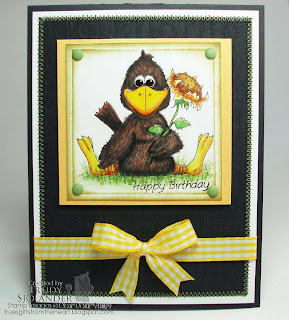 Here is a card made with the technique used in this tutorial. Here are a couple of other ways I have also colored this image. This is a very fun image to color because you can do it as simply or as detailed as you would like. Hope you've enjoyed this tutorial. If so, please leave us a comment so we will know to do more! 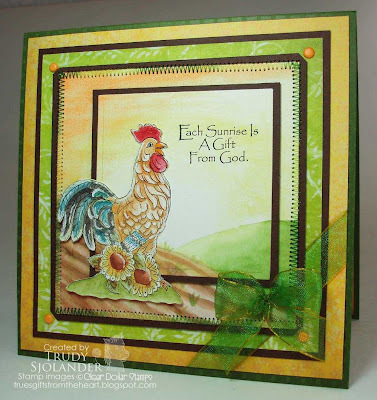 CDS STAMPS USED: "Rooster Sunrise"
True :D here and it is time for another coloring tutorial. 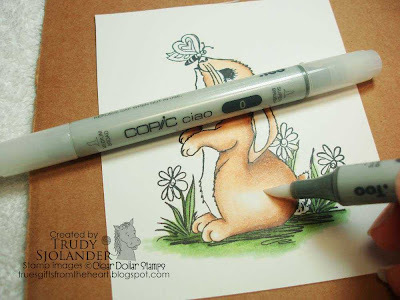 This time we are going to mix it up with Copics and colored pencils with OMS. 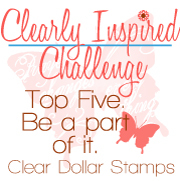 that released this month @ Clear Dollar Stamps. There was really no way to get this all in a 10 minute video so there are 2 parts. Remember, you can click on the 4 arrows in the lower right hand corner of the viewer to watch in full screen. Hit "Esc" on your keyboard to return to normal. Here are a couple of other ways I have painted this image. 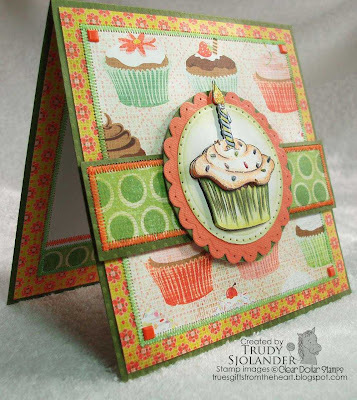 If you would like the card recipe or more details, please visit MY BLOG. 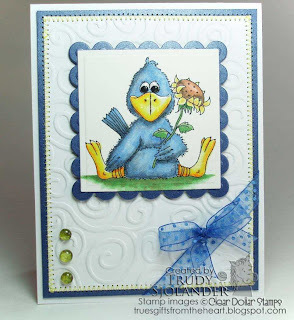 Today I am doing a tutorial with one of Clear Dollar Stamps new April releases. 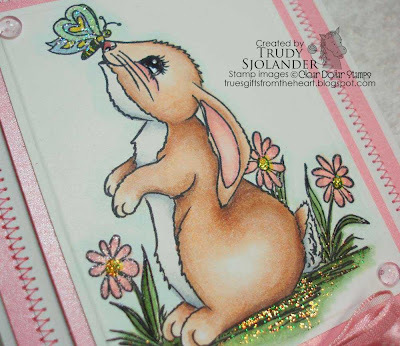 It is "Butterfly Bunny" and it is illustrated by.....ME!!!! Wooo hooo! 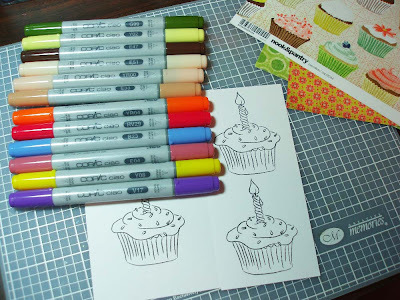 I will just start out by giving basic instructions and then you can follow along on the pictures that show what colors to use and what areas to use them in. 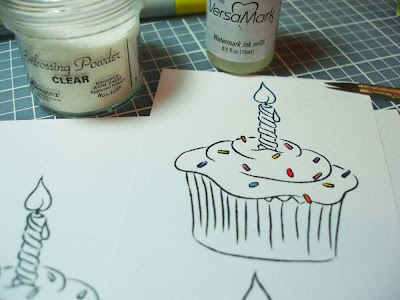 You want to make sure that you stamp your image with a brand that works well with alcohol inks. I use Memento's Tuxedo Black and then set it with my heat gun for good measure. 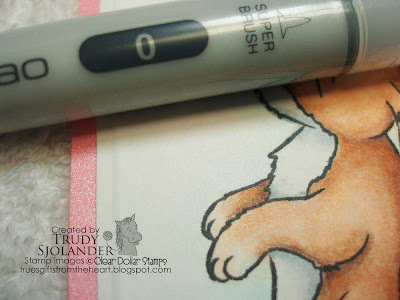 I personally always use the pointed (brush) end of my Copic Markers for more control in smaller areas. I always start with the darkest shade first. This is the shadowed area. My imaginary light source is in the upper left hand corner this time so the darker shading will be on the right side and under overlapping body parts. The lights and darks in the shading give the image a more dimensional look. The rest of the colors will be used in decreasing color value also. 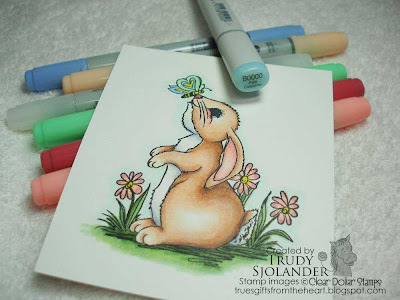 For instance I used 5 colors on the brown part of the bunny's fur,darkest to lightest. 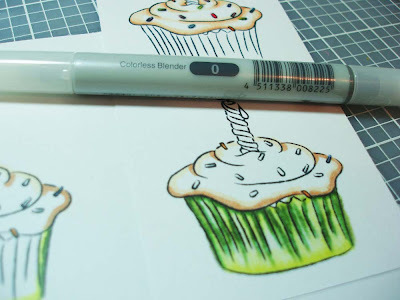 You will also want to overlap the previous color so that the lines are blended out. I sometimes use straight lines when blending but usually do tiny circles. It really depends on the size of the area and how much color I want to "pull " out. OK..enough of the boring stuff. Let's get to coloring! Remember, you can always click on the picture to enlarge for better detail. Let's start with the grass. Colors used: G99, G21, Y11. 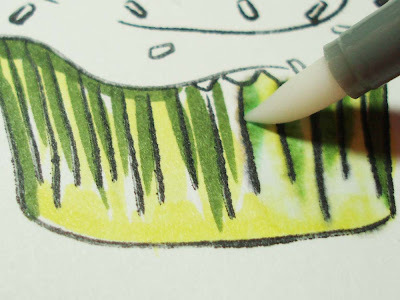 Tip: I didn't quite have the shades of greens I was looking for so I went over all of the grass with Y11 yellow.If you need to blend in the edges, use your colorless blender. On to the brown fur. 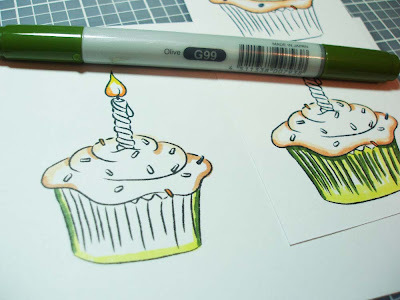 Colors used: E47, E35, E33, E51, and colorless blender. 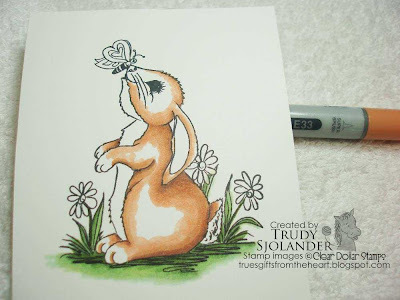 I left a little white in the center of the bunny's hip and around his eye then used the colorless blender to smooth it all out as shown in the next photo. 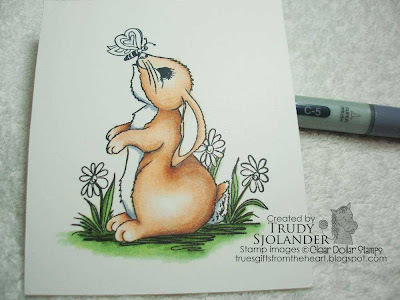 Next is the bunny's white fur. 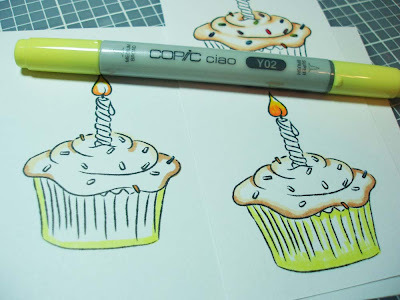 Colors used: C5 and colorless blender. 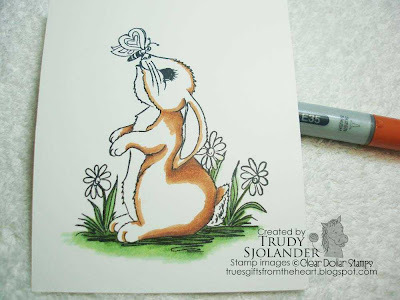 Next is the nose, ears, cheek and flowers. Colors used: E04 and E93. 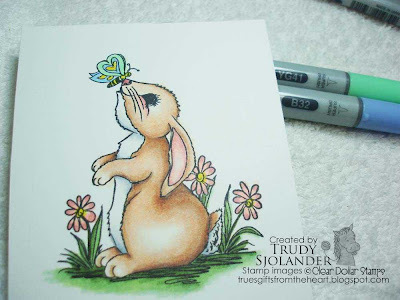 For the flower centers and parts of the butterfly I used Y08. The other parts of the wings are done with YG41 and B32. 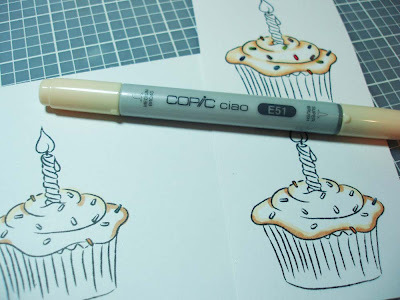 Tip: Don't worry about shading the tiny little parts. I absolutly love useing B0000 to go around the edges of my images. It adds just a touch of blue so it looks like the sky and any stray marks get erased. Go back and look closely at the previous pictures...I don't always stay in the lines! LOL! 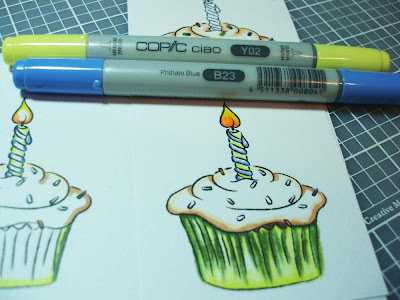 I decided to do a CAS (Clean And Simple) card for this tutorial so the image coloring would be the focal point. 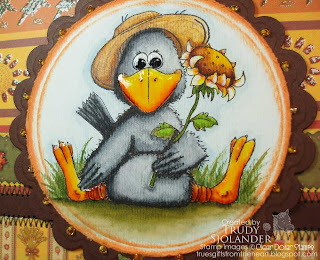 If you have enjoyed this tutorial, and I so hope you did, please leave a comment below. 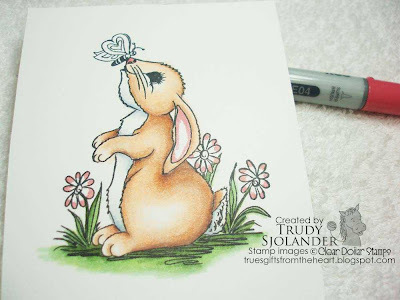 Then you can hop on over to my blog and see the other samples I have done with this stamp. 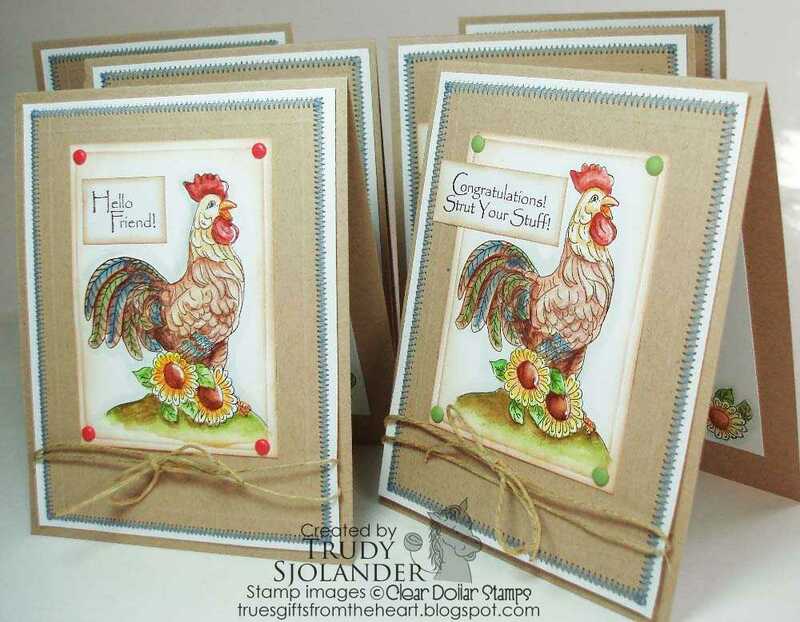 While you are there, don't forget to mention that you saw my tutorial on Lori's blog!. Thanks so much for taking the time to follow along. Hi friends, its Katie here to welcome you to another Tuesday. I hope you are having a wonderful day. If you recall, last week I showed you a great way to add texture and a different look by paper piecing. 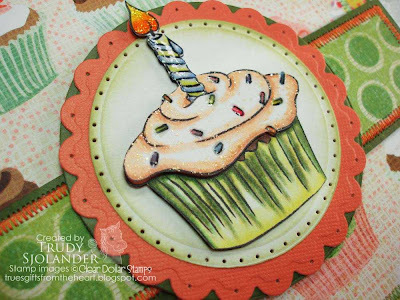 This week, I thought I would continue last week's theme but show a continued version of paper piecing which adds even more dimension and indeed has a name. 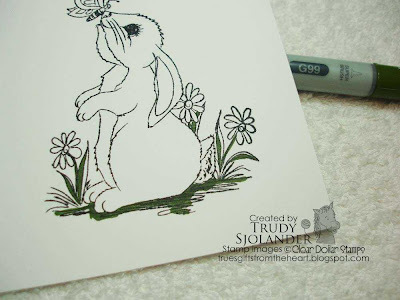 This technique is called Paper Tole and it is simply adding dimension to an image by cutting and using dimensionals aka pop dots to create this look. So, lets get going. 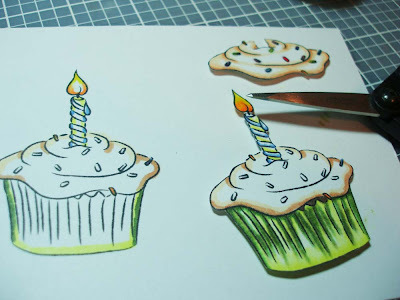 Like I said, paper tole is just a method of cutting and separating bits of your image to create depth by layering. 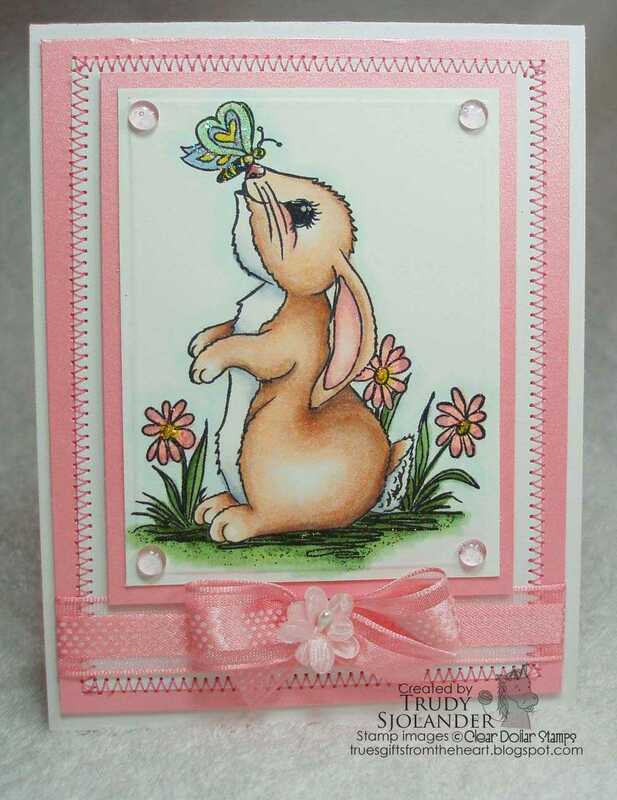 I start by stamping a layer piece and then several more images. If you need to stamp even more later, no biggy. 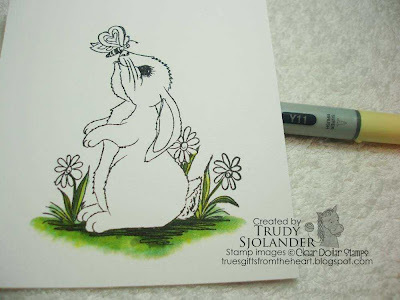 I can find the ink that I use HERE... the cardstock HERE... and the stamp HERE. I color in my base image and this is a great place to kind of experiment a bit with your colors since most of it will be covered up. BUT... I do test my colors on a scrap piece of cardstock before I get started. I started with the center and used my darkest Copic to color it. 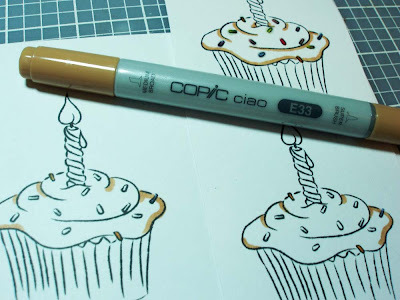 Simple... just color. Then on the ruffly center part I used that same marker to color the inner most section. 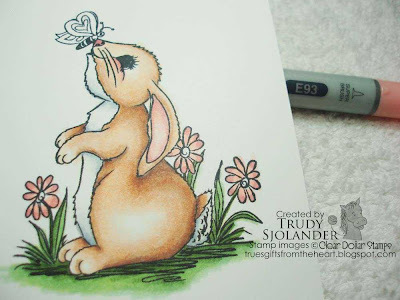 Then I used the medium pink to color in what would be the centerish part of this section. I color in a circular motion and essentially end up coloring over the darker pink. Don't go all the way to the edge though. 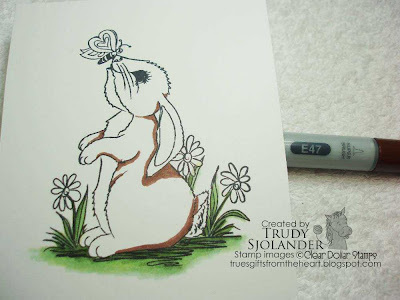 Then use the lightest pink to finish coloring in this section. 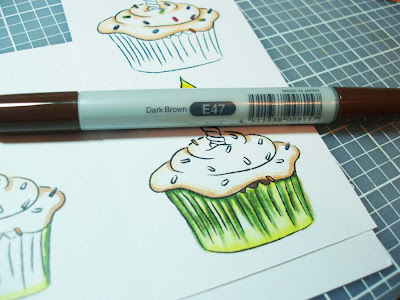 Just keep coloring until you are satisfied with the look. Continue the same way for the center sections of the pansy. For the larger section I grabbed the darker pink marker and did the same thing as the smaller sections. Then I took a new lighter pink marker and colored in the rest of the section. I only used 2 markers for this part of the petal. 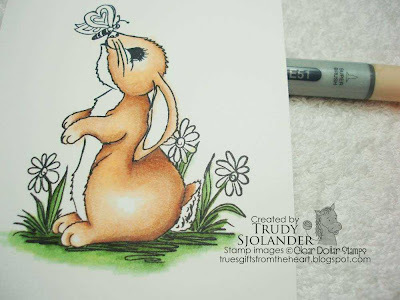 For the leaves and stem, I followed the markings provided by the stamp and used the darkest marker and followed the lines. 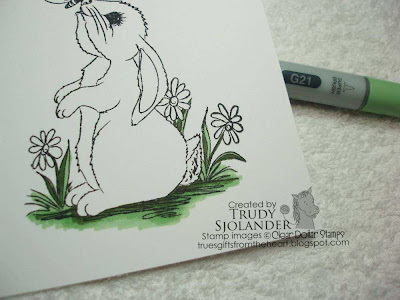 Then I took the medium green and just accented along the sections of the darker marker. No rhyme or reason... no light source, just going with it. 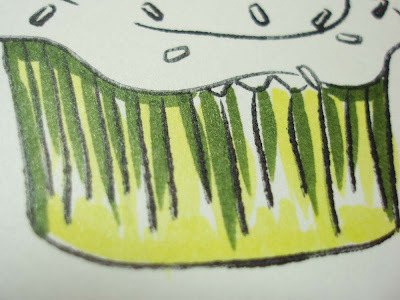 Then take your lightest green marker and color over the entire stem and leaf section. And finally, I took the darkest pink marker and colored in the smallest sections left on the pansy petals. So, I did all this one more time and then cut out most of my image except for the leaf up towards the petal. Then I used some pop dots and attached them to the back of my cut out pansy. These pop dots are 1/16" thick. Then place on top of the 1st stamped and colored image. Next layer... at this point it is up to you how you want to start layering and how much. I chose to cut out the circled section. 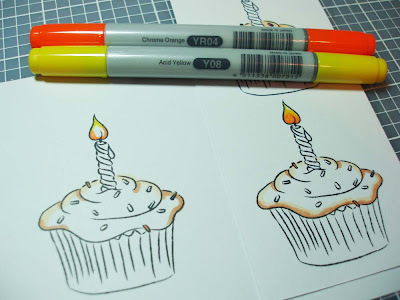 Remember at this point, you don't have to stay within the lines - yay! For my next layer I decided to focus on the bottom petal and the fuzzy edge sections. And my last layer was the very center and the center and bottom fuzzy section. Ooops... I did use the Nestabilities Labels 8 to cut out my original stamped and colored image before building. Then I decided that I would keep this very simple and use the contrast between the colored pansy and the clean white of the card, but I did want to add some dimension by creating a frame. I used the same size label 8 nestability to cut out the front of my card. I always use a piece of tape to hold my die down, but remember to "de-stick" a bit by putting it on your pant let or just sticking it to a piece of scrap paper first. 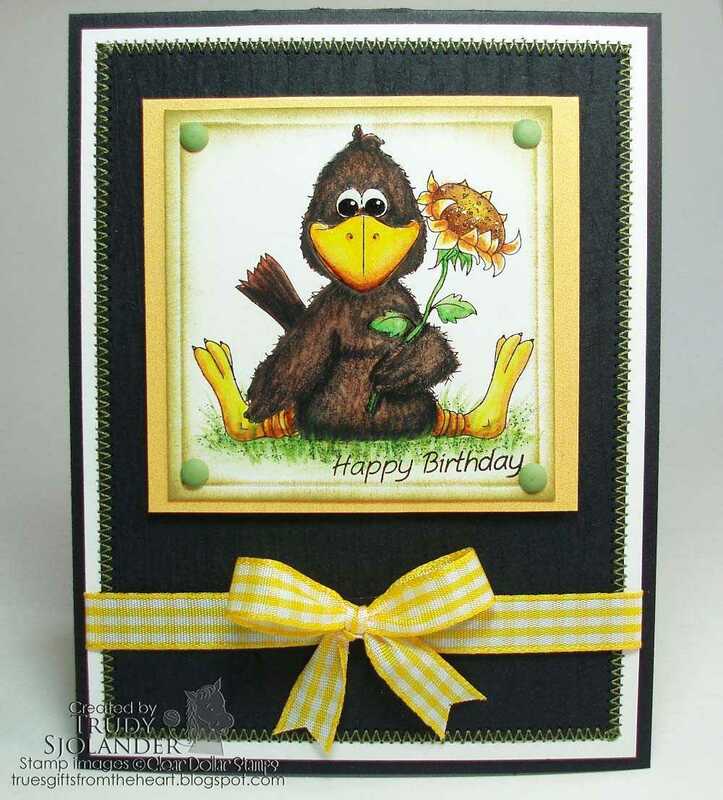 I lined up the piece that was stamped and paper toled and added some dimensionals and then placed it on the inside of my card, but used the cut on the front as my guide. I then decided that I wanted a frame for the front of my card so I took the same die that I had previously used and the next size up... taped them together and onto the cardstock and ran it through my cuttlebug. The final step was to add more dimensionals to the inside of the frame and then place that on the card front. 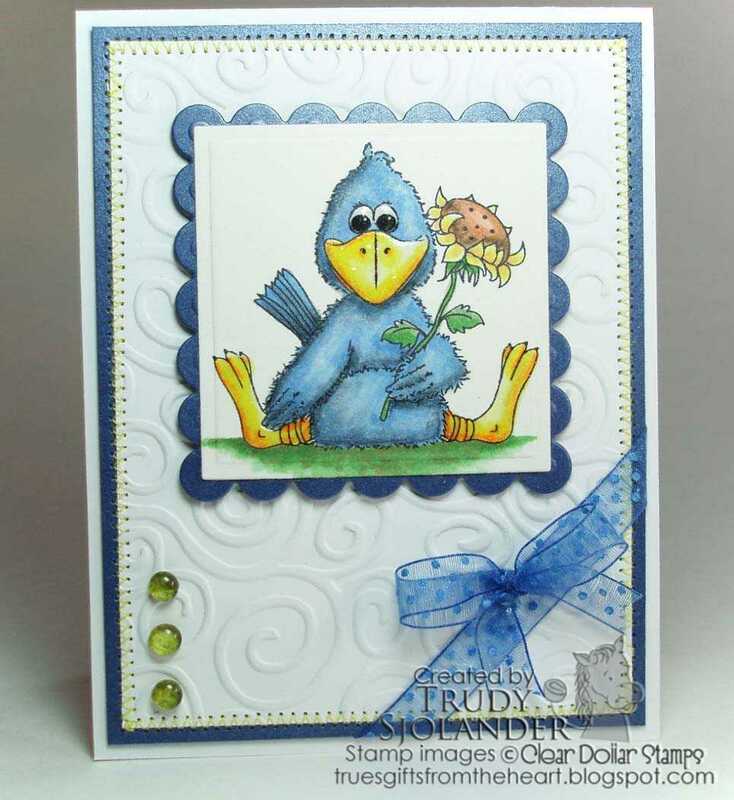 Thank you all for coming to visit Clearly iStamp and I wish you a very happy Tuesday.